We’ve seen a lot of unusual animals with odd medical problems, like the naked penguin and the world’s ugliest bird. 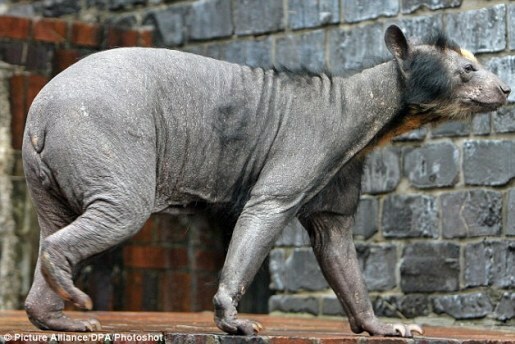 While both those critters are pathetic in their own way, there’s nothing quite as sad (in a silly way) as the plight of poor Dolores and the other spectacled bears of Leipzig, Germany, who are completely bald save for a little fuzz around their faces. I know what you’re thinking: it’s just some mange going around. All the bears are bald. While it is true that all of a specific type of bear are bald, not all the spectacled bears are bald. In a reversal of the human condition, it’s the female spectacled bears that are bald, while the male bears are as hirsute as ever. The weird condition has made the bears a serious tourist attraction, drawing hundreds of visitors a day. Vets aren’t sure why their summer coats fell out and their winter coats never came in, but here’s hoping they’ll turn the heat up in the bear enclosure until this all gets sorted out! Maybe some Weezer Snuggies will fill in the gap in the meantime.